- You’ll find this quest just west of Mulbrydale, the first tiny village in Velen. Take the road west out of the village and you’ll see the quest giver, a priest and red and white, praying on the side of the road. Speak to him to begin the quest; he’ll give you three Holy Oils. To the north of where you met the priest, in the middle of a field. Protected by a small pack of Ghouls. To the southwest of where you met the priest, at the north end of a dead-end dirt road. Protected by some Wild Dogs and a Rotfiend. To the southeast of Mulbrydale, another in a field. Protected by more Ghouls. 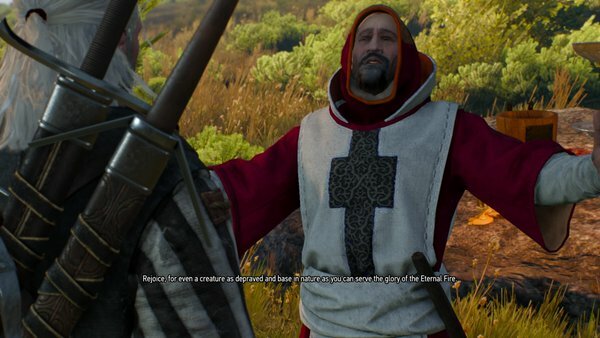 - During your final slaughter you’ll meet a dude named Titus who will badmouth the priest, assuming he survives and Geralt thinks to ask him about the man. After he’s done talking, fire up the last body pit and head north to meet the priest, who’s waiting in a small gazebo on the water’s edge, north of Mulbrydale. If you didn’t save Titus, or if you didn’t ask him about the priest, you’ll receive 20 gold and end the quest. Cheap. If you saved Titus and learned about the priest’s foul play, you can take a bribe of 60 gold to stay quiet and end the quest. If you saved Titus and learned about the priest but did not accept the bribe you’ll have to fight the priest and his two guards. A quick shot of Igni and a sword slash should kill the priest; the guards will take some more conventional swordplay. The priest is carrying 200 gold. Quest over.